Today starts a new chapter in American history. We not only have the largest population of women in the House of Representatives, we also have the first two time serving Speaker of the House – who just so happens to be a woman! This is all great news for women and in my opinion our country. We are coming out of one of the most tumultuous two years our generation has ever experienced. The discord; lies and disrespect of humanity that we have been witnessing has had a negative effect on all of us. I don’t know about you, but lately I’ve been only watching the last 5 minutes of the evening news just to take in a feel-good story. We need to be reminded that good things are happening every day. But I don’t want to make this a political statement. This blog is more of a reminder that each woman has the ability and responsibility to be a strong leader. Women and men lead very differently and have different mindsets around leadership. The women I speak to see leadership as their personal journey – their obligation to positively impact the lives of others. Some men have a similar perspective. First, I want to ask each of you reading this blog, do you see yourself as a leader? Do you think of yourself as someone that has the ability to create change, to have an impact, to stand boldly in your convictions? Leadership is not a perfect science, so to speak. As hard as I work to show up as a leader, I see myself stepping backwards at times. Just today, I found myself doing something that was in conflict of my values. I didn’t stand up for what I believed was right but instead tried to appease someone else. The “pleaser” came out of hiding and took control before I even noticed. I felt the knot in my stomach but didn’t react to it fast enough. When I realized what I did, my first reaction was to knock myself down and feel discouraged about my abilities as a leader and business owner. But what I know about strong leaders is that they constantly learn. I thought through the situation and gained some new insights about myself. I created a plan to take control of the situation – not just for my own sake but for the growth of the other person. The outcome will be some lost revenue for me, but a great impact for the other person. That’s what leadership is. So, what does this have to do with our female representatives? Unlike what we have seen from many of our male politicians, I feel that we will see a push to get things done that have a positive impact on people – whether it is around the environment, healthcare, human rights, the focus will be on the welfare of people. Female leaders care about having a positive impact on the lives of others. 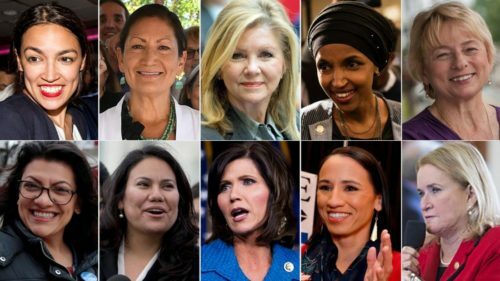 Second, while there are more women than ever before in the House, like all women, they still have to work twice as hard as a man to get the same recognition. But true leaders don’t mind doing the work. Female leaders are not there for the fame or glamor of being known, they are there to get things done; to stand strong in their convictions. I am so excited to see what these amazing women will accomplish and how they will leave their mark on our society. I encourage each of you to aspire to be your best in 2019. Look for opportunities to find what is important and meaningful to you. It is from this awareness that drive, determination and power come from. Use that energy to change the status quo. Notice how you grow as a leader and notice (like I did) when you falter. These missteps are all part of our leadership development. I’m still reprogramming over 50 years of being a follower. This role of leader is exciting and feels so good. Keep working at your development. Keep trying new things to expand the dimensions of your comfort zone. Let’s all stop playing small and start living big. 2019 is your year. Be the best version of yourself. Please share your stories with me so we can celebrate together!